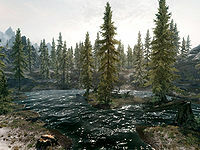 Clearpine Pond is a pond with a small island, located west-southwest of Solitude, just to the northeast of Pinemoon Cave. The island is easily identifiable by the pile of logs and multiple fallen trees surrounding the island. The island is inhabited by from one to three spriggans, but they do not attack unless you come within close proximity or take items from the dead alchemist or open the chest on the island. The spriggans can be engaged on your own terms by placing a rune spell at the base of the trees they're hiding in, similar to the way you can flush out draugr and skeletons slumbering inside sarcophagi. The spriggans will not cross the water surrounding the island, so you can easily pick them off with ranged weapons or spells or retreat and heal yourself if you struggle in a melee fight with them. This page was last modified on 18 November 2017, at 22:49.